A teenage girl is transformed into a reluctant superhero and must balance her old life with the dark secret of who she has become. Prima ballerina Anthem Fleet is closely guarded by her parents in their penthouse apartment. But when she meets the handsome Gavin at a party on the wrong side of town, she is immediately drawn into his dangerous world. Then, in a tragic accident, Anthem falls to her death. She awakes in an underground lab, with a bionic heart ticking in her chest. As she navigates her new life, she uncovers the sinister truth behind those she trusted the most, and the chilling secret of her family lineage…and her duty to uphold it. I did something I never do with The Broken Hearted. I looked at reviews before finishing the book. This is typically a big no no for me (unless I am really horrified/ grossed out by a book and then I will read to see if those parts end.) I was pretty shocked and discouraged by the reviews- they weren't exactly glowing. I decided to finish the book and I am so glad I did. 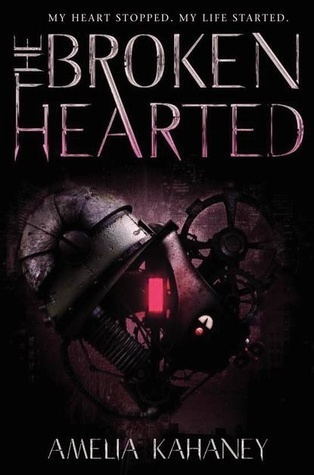 I honestly really enjoyed The Brokenhearted. Is it a book that is going to change my life forever? No. Did it have issues? Absolutely. Did I really enjoy it anyway? YES! The Brokenhearted is a superhero origin story. I am a sucker for anything that has to do with superheroes or comics. Some really terrible things happen to our main character and she is suddenly with new powers (and a new heart to boot). I have to say, the first section of the book- I found it to be a little disjointed and rushed. It was almost as if the author was rushing to get to the important part- the part where Anthem (our heroine)gets her new heart. She makes choices that didn't seem true to her character but were convenient for the overall plot. I have to say, once this change happened- the book seemed to flow a little better. I started to understand where the author was going and I genuinely enjoyed reading this book. There is a ton of action, and a ton of fighting for Anthem. We get to see her use her powers quite a bit, and yet by the end of the book I get the feeling that we don't know the true extent to her powers. I really do hope there is a sequel to this book- it was so much fun to read. I could totally see this as a series (or a television show). Now, I am not saying that this a hard-hitting emotionally intense book. Rather, it is more like watching a super hero show on the CW. I enjoyed it immensely and will be happy to come back for more, but it didn't really hit me that much and make me feel a whole lot. I did however, really like this book as a relaxing way to take my mind of my life.